As pharmacists see more obese patients and pharmacotherapy becomes increasingly complex, they need a resource that puts all the necessary information in one place and makes it easy to use. 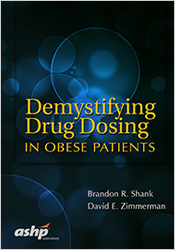 Pharmacokinetic parameters in obese patients Summary tables, examples, and sample calculations put practical information at practitioners’ fingertips. Content by nationally recognized authors— edited by credentialed practitioners who’ve been there—supports scientifically sound decisions. Puchase this product as an ebook on ASHP eBooks.